Each of the chapters on these composers – all living as of the time of publication – follows a uniform format: an account of life, works and career; then an interview; followed by formal technical analysis of a single work; notes; list of works; discography; and sources; and notes on the authors. At the very end are biographical notes about each of the very accomplished authors. Thus the book serves not simply to make more prominent these distinguished composers but has considerable reference value besides. A quibble about the title: Any "influence" on others is not a theme of this book. Each of the composers stands alone as unique. "Women of Significance…" would have made a strong claim without misleading the prospective reader. As for the emphasis on their gender, each woman was asked how they felt about that, and whether they had experienced any discrimination on account of it. On this matter there was a wide range of opinion. Cindy McTee asks, "has anyone ever heard the term man composer? Or do you think you can identify the gender of a woman by listening?" (330). Marga Richter felt, however, that a woman might express herself in music differently from the way a man composes (366). Richter thought it was wonderfully unique to be a woman composer – until 1975: "when we started the League of Women Composers, we found out there were hundreds of us…" (374). Judith Shatin did not think of herself as a woman composer, but the fact that others did was brought home when she arrived at Tanglewood to study composition and heard, "Ooh, a lady composer" (432). In her conducting role, Tania León, who dislikes labels, said she needed to work twice as hard as male conductors, and she prefers to be identified by her name, not her gender (256, 271). Jennifer Higdon said she never was faced with discrimination, but mentioned that some who came before her – Libby Larsen and Joan Tower – surely had. All of these composers are verbally articulate to a high degree – I'm especially impressed with Libby Larsen's interview – and willing to discuss their creative procedures – which are highly varied. I shall begin with the oldest and most conservative composer, Marga Richter, who has never been a self-promoter, and whose recording by Gerald Schwarz and Seattle I am eagerly awaiting from ArkivMusic. Richter often expresses romantic moods, which have been inspired by poets from China, Japan, Ireland, and America, as well as by Nature. When her mother died, she composed a Lament and when her husband died in 1988, her music became less dissonant and more consonant. Landscape inspired her orchestral works Blackberry Vines, Winter Fruit, and Out of the Shadows and Solitude. European composers from Handel to Shostakovich have also inspired Marga Richter, and she sometimes quotes them. She also likes Bach, Beethoven, Bartok, Stravinsky and Hovhaness. Richter's hundred plus works are in many genres and composed intuitively in a "contemporary style," independent of any system; they are tonal but dissonant, with modal patterns and frequent use of second and seventh intervals. She said "melodic contour, rather than any formula for tonality or serialization, is the fundamental element in my music" (367, n. 26). Leopold Stokowski, after hearing one of her early works, said she should not study composition lest she lose something very unique and fresh. (Gershwin received similar advice.) However, she went to Juilliard and studied with Persichetti, after beginning with Rosalyn Tureck. Richter reports that what Tureck taught her about rhythm was "a revelation." Rhythm became very important to her (as to other composers featured in this book.) In her interview, she said that "what sets my music apart from a lot of music I hear is that I am very conscious of where the downbeats are." She wants the audience to hear them too. At Juilliard, Persichetti taught that "any tone can succeed any other tone." He helped Richter – and his other students, including Glass and Druckman, – to be themselves. So did Bergsma and Peggy Granville-Hicks. Richter's forms are "free flowing." Her Clarinet Sonata "just came out of nowhere. I found my rhythmic excitement, and harmony, everything. And I just started pouring it out, I didn't think about it." Jennifer Higdon is one of the youngest of these composers. Higdon and Libby Larsen are the only composers brought together here whose music I am currently familiar with. I have actually met both of them, briefly, not that I expect them to remember me. I drove from Wisconsin to Indianapolis to hear the premiere of Higdon's Violin Concerto played by Hillary Hahn and I reviewed both the concert and the subsequent recording of that piece at www.classical.net. Both Higdon and Hahn are lovely, kind and open people and they were both available following the concert. I had heard Higdon's Blue Cathedral and her Concerto for Orchestra performed in concert by the Milwaukee Symphony Orchestra, and had spoken with Hahn in Milwaukee some time before the concerto's premiere. McKinney chose Higdon's Concerto for Orchestra as the work to analyze in depth here, an excellent choice as the work's first movement, particularly, can be hard for the listener to grasp, especially on first hearing. (Marga Richter's son told her that new works needed to be heard three times before making a judgment; unfortunately, few new works are given this chance.) But Higdon's Concerto for Orchestra was immediately greeted enthusiastically, by audiences, critics and performing organizations. The result for her was enough commissions for her to live from – and for – her music. Today she publishes her own music and has many recordings. (Her works list fills three and a half pages.) Higdon's secret is her determination to communicate, with melody and rhythm; "accessibility" is not a bad word for her, and she works with performers. She grew up hearing only popular music, especially the Beatles. An exception was when her parents took her to hear the Atlanta Symphony and to a ballet. Higdon's instrument was the flute and she began writing music only when she was in college – Bowling Green – at the urging of her flute teacher, Judith Bentley. Then she studied conducting with Robert Spano, who steered her to Curtis (where she teaches today). At Curtis she studied with Ned Rorem for two years, before going to the University of Pennsylvania for a master's and doctorate. At Penn she studied with George Crumb. He and she talked about color, which she found analogous to her father's paintings, which he produced at home. She accepted Crumb's final test of a piece of music: how it sounds. (Hindemith felt that way too, in spite of his theoretical commitments.) Higdon's "wow" moment was to decide that how music sounds should come first as a consideration, thus to write interesting music. McKinney noted that it is hard to fit Higdon's music into "any box of standardized forms." Higdon's response, "I'm pretty formless," but she does try to shape her music the way a sculptor does. Higdon uses the octatonic scale a lot, having been influenced by Stravinsky and Bartok. When commissioned by the Philadelphia Orchestra to write her Concerto for Orchestra she was careful to avoid Bartok's comparable work. "The first thing I did was put away my Bartok score and recording…That and the Lutosławski." During the process of writing the work she consulted the orchestra's players extensively, and responded to their requests for certain effects. In the middle of her composing this piece came September 11, 2001, which so affected her mood that she needed to set aside her work for some time. The work, for her, was to produce fluctuating color and texture, and 9/11 "was as if someone had dumped black paint into my oranges, yellows, and reds" (164). Larsen's early musical experience was of her father's Dixieland jazz and her mother's boogie-woogie. Her first musical training was learning to read and sing Gregorian chant in grade school, which gave her a continuing sense of freedom in music. Her high school musical experience, in contrast was "hideous, because choir members were taught to sing by rote." Later she saw her daughter lose interest in playing in her high school band. These instances spurred Larsen's activism in improving musical instruction nationally. Stallard says that "the hallmarks of [Larsen's] compositions are rooted in basic craft – rhythmic vitality, motivic structure, and harmonic language." Her rhythms are informed by the American vernacular, which she noted is more rhythmic than melodic. Larsen says , "My path to composition came through an interest in words and rhythm and the ability to notate those." She often forgoes bar lines in favor of phrase markings "for grouping metrically free musical ideas." She creates and maintains a tonal center by the use of pedal points surrounded by "nonfunctional" notes, as in the fourth movement of Water Music. Larsen claims ability in systems planning as one of her strengths – in both musical and non-musical contests, to determine multiple solutions to the problem of resolving an issue. She is good at both verbal and musical communication. Clearly she has a brilliant mind. Asked about her early musical influences, Larsen mentions an early acquaintance with Rimsky-Korsakoff's Scheherazade, when she was struck by the totality of the orchestration as part of the music. There was no follow-up question. Larsen studied composition at the University of Minnesota. She praises Paul Fetler for teaching "the principles of unity and variety, of tension and release…and the value of a single note" (204). She stayed in Minnesota because of the wealth of its performance venues: "seven orchestras and choirs everywhere." Larsen says she never sought prizes or validation from other composers. It is great performers she looks to for that. About performance of her own music, she says she is flexible about tempo and dynamics, but very rigid about repeats, which she forbids. Larsen's music is tonal, but she rejects the kind of functional tonality where one note necessarily leads to another. (We have heard this before, from Persichetti.) Her music is linearly based and she says that "shape is more important than melody" (207). She works hard in constructing her motives, once constructing "a gesture that had the potential for a hundred variations in the space of three beats….The potential of just three notes is almost infinite." And "the cleaner the notes, the more depth of experience for the listener… I don't think students know the value of a note any more" (208). She also says that teaching people to listen for pitch and rhythm is "narrow-minded" and academic. Gabriela Lena Frank is a composer with a tremendously strong will having overcome difficulties which would have stopped others in their tracks. She was born with partial hearing impairment. She faced this head on and felt that in consequence she could understand Beethoven's continued creativity following his deafness. She wrote first a five-page paper and then a thirty-page paper on that subject and even proposed turning the latter into a doctoral dissertation. As if one disability were not enough, she developed a case of Graves Disease. In her case the disease was so serious that she lost most of her vision in one eye. That did not stop her either. An extraordinary woman! Frank's musical ability earned her a D.M.A. degree in composition from the University of Michigan in 2001 and two years later she was offered a contract with G. Schirmer, Inc. She then earned numerous commissions, residencies, performances and awards. Her speaking engagements include outreach to diverse audiences. Her own background includes a mother from Peru, who is a stained glass artist and a father of Lithuanian Jewish descent, who is a Mark Twain scholar and an editor at the University of California; they met in Peru. Gabriela was born in Berkeley and later had contact with Peruvian musicians. She studies Peruvian music and ethnology, including Inca and Pre-Inca traditions. She identifies as Latina. Gabriela paternal grandmother was a gifted pianist and Gabriela began piano before she was five. She learned through hearing the piano's vibrations and imitating her teacher. It was her kindergarten teacher who recognized the basis of her hearing loss, which hearing aids then largely corrected. Speech therapy helped also. Somehow she is gifted with perfect pitch, though getting good intonation on the violin was beyond her ability. Because of strong support from her parents, Frank went to Rice University, majoring in composition and piano. Her early compositions had been tonal, but at Rice she acquired a love for the music of Bartok and Ginastera. She won a composition prize with her third string quartet. In 1995 she wrote the widely performed Manhattan Serenades, which is jazzy, for cello and piano, and her master's thesis was Movement for String Quartet, influenced by Lutoslawski, which became part of her string quartet Inkarri. Without encouragement from Rice faculty members, Frank continued academic study at the University of Michigan, where she studied composition with William Albright and Michael Dougherty, piano with Leslie Bassett, music history with Steven Whiting, who encouraged her study concerning Beethoven's deafness. She won a competition with a piano concerto, and she was able to play the work with orchestra. Bolcom encouraged her to go to South America, for which she studied Spanish and received grants. But the music which followed was influenced more by Lutosławski's aletoric gestures and some Gubaidulina, in Las Sombras de los Apus for cello quartet. Hayes analyzes this work and Sonata Andina. Following that, Frank wrote Cuatro Bosquejos Pre-Incicos, for flute and piano; and, among other pieces, Illapa: Tone Poem for Flute and Orchestra, which was performed in Brazil and by the Chicago Symphony Orchestra. Requiem for a Magical America: El Día de los Muertos for large wind ensemble, accompanied by a University of Kansas dance ensemble. Llorona: Tone Poem for Viola and Orchestra (mythological subject, European musical tradition) was enthusiastically received when premiered by the Houston Symphony. Ritmos Anchinos for string quartet, sheng in D, and pipa, her first piece written for the Silk Road Ensemble, combines Chinese and Andean elements and was dedicated to Frank's mother's half-Chinese father. From 2007 to 2009 Frank was resident with the Indianpolis Symphony Orchestra and wrote a piece inspired by her work with local Latino immigrants. She has succeeded in becoming self-supporting through freelance composing. In her interview, Frank says her approach to creative work is inspired by Bartok's "handling of harmony, form and folkloric style," but she is "more of a programmatic composer than him." She maintains awareness of what it is like to perform what she writes, and finds "you can do a lot sticking to the traditional vocabulary of the instrument." She likes to create sounds "without asking for very avant-garde techniques" (112). She also uses a scissors and paste method of ordering what she writes, and she writes in her journal regularly. The work selected for in-depth analysis is her 2001 piece, Leyendas: An Andean Walkabout, for String Quartet. Tania León was born in Havana of mixed heritage: French, Spanish, African and Chinese. Her musical aptitude was recognized by the age of four, when she began piano at the Carlos Alfredo Peyrellade Conservatory, where she also began violin and theory. In1964 she earned a master's degree from the National Conservatory of Cuba. She was successful there as a concert pianist but felt a personal need to leave Cuba, and went to New York, where she became accompanist at the Harlem School of the Arts. A year later she was music director of the Dance Theatre of Harlem, a position she kept until 1980. Beginning in 1971 she had begun to conduct, at the Festival of Two Worlds in Spoleto, Italy, with the Juilliard Orchestra. Before the end of that decade she studied conducting at Tanglewood with Leonard Bernstein and Seiji Ozawa. She worked with Lukas Foss in Brooklyn, introducing minority composers and performers there. She was also new music advisor to Kurt Mazur at the New York Philharmonic and was Latin American music advisor to the American Composers Orchestra until 2001. She has guest conducted internationally. León's compositional career began in the late 1970s, combining her classical training with Latin American influences into a personal style. The National Endowment for the Arts commissioned her first orchestral work, Concerto Criollo in 1980. Numerous commissions followed. In 1985 she became resident composer of Lincoln Center Institute. She is best known for solo piano works and piano with ensemble pieces. Among numerous honors, in 1998 León was awarded the New York Governor's Lifetime Achievement Award, and also the Fromm Residency at the American Academy in Rome. Since 1985 she has taught at Brooklyn College, later with a named chair and in 2006 she was given the rank of Distinguished Professor, a rare designation in the academic world. Stylistically, León favors improvisation and utilizes elements of Latin American, jazz, and gospel music. Her harmonies are contemporary and her rhythms angular and energetic, including the use of syncopation and cross rhythms. Her use of ostinato, sometimes combined with static harmony, is meant to suspend the pulse temporarily. Rhythm is her "primary generator of form." Her works are generally through composed, rather than in traditional form. Her phrasing is irregular and varied. Spinazzola analyzes Indigina and other works briefly before – and at length following – his interview. There León focuses on the inspirations and goals of her music, rather than on technique. She names Stravinsky as among her foremost influences, and also mentions Janáček, Ligeti and Ives. Although she studied the Second Viennese School, she does not usually use their techniques; rather, she maintains some tonal centeredness even in her most atonal works. She works from sketches and does not feel a need to compose at the piano. She says she can compose anywhere. She traces her rhythmic vitality to the prevalence of dance in her early years in Cuba, but she says that motion rather rhythm, is the most important element of her compositional style, with form being less important to her. Elizabeth R. Austin immediately gained my attention by the fact that she was one of Nadia Boulanger's many American "pupils," as she called them, and who include several of my favorite composers, from Copland to Harold Shapero. Austin's happiest recollection of Boulanger was the teacher beaming happily at her after Austin's successful response to an impromptu demand to "Improvise a diminished seventh resolution in all twenty-four keys without stopping" (24). But I was appalled to read that Boulanger's reaction to seeing Austin in the company of a young man was to tell her to go home and have six children. Well, she did go home, in 1961, and had three children, one of whom developed a serious case of asthma, which was a distraction from composing, to say the least. In 1979 Austin studied for her master's degree at the University of Hartford, and her creativity burgeoned. Doctoral study at the University of Connecticut, combined with teaching and work as organist, plus caring for three children, strained her marriage to the breaking point. Meanwhile, she wrote music, including her first symphony, and received awards for it. An opportunity through the Society of Women Artists in German speaking Countries (GEDOK) gave her an opportunity to lecture in Mannheim and she had performances there. She also met her second husband, Professor Gerhard Austin, who directed the Mannheim and Jena Programs for Bilingual Careers, and the couple spent several years in those cities. Selected for detailed analysis is Austin's Symphony #2, "Lighthouse" (1993, rev. 2002). 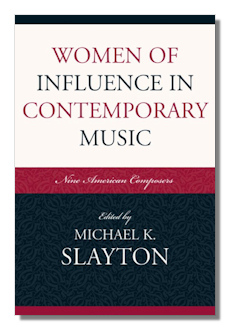 Cindy McTee is one of two composers Slayton chose to include in this book. Slayton says that "Cindy McTee is one of those people for whom postmodernism is such an easy fit you forget she's wearing it" (323). Most of her compositions are for orchestra, symphonic band or instrumental chamber ensemble, including electroacoustic (live-tape) pieces. For a quarter of a century she taught at the University of North Texas, which has a very large music program. She has not been prolific, understandable in an academic, but works of hers have been commissioned by various Texas orchestra, including Houston and Dallas. Movement and gesture in her music she attributes to her love of ballroom dancing. Her quotes from other composers include those of Bach, Ravel, Stravinsky, Ives, Penderecki, Barber, and Jerome Kern. Jazz and popular music have been sources for her. Perhaps surprisingly, sports car racing and the sounds of "finely crafted machinery" have inspired her. Slayton says "McTee is part composer, part engineer, part experimental physicist" (301). Her intellectual interests range from Einstein to Carl Jung, and she takes an intellectual approach to composing, utilizing a wide range of techniques. McTee grew up "surrounded" by music, mostly popular. At Pacific Lutheran University she majored in music theory and composition. At the end of her junior year, she was invited by Krzysztof Penderecki, who was visiting for a week, to spend a year with him in Cracow, living with his family in exchange for giving English lessons to his two children. She studied composition with him, and counterpoint with two professors at the Higher School of Music. After graduating from PLU, McTee went to Yale, where Penderecki taught. McTee also studied there with Jacob Druckman and studied jazz with David Mott. Her piece for jazz band is Eatonville. Her second period of study in Europe was at Tübingen. After completing her master's at Yale (and writing Chord there in 1977), McTee earned a Ph.D. at the University of Iowa in 1981. She then taught at PLU for three years. McTee's interest in computer music led her to Larry Austin's Center for Experimental Music and Intermedia (CEMI) and then back to Cracow, where she was Senior Fulbright Lecturer in Computer Music at Cracow's Academy of Music. In the 1990s McTee's pieces for acoustic instruments include Soundings for band, Changes for cello and bass, and Einstein's Dreams for flute, clarinet, cello, violin, vibraphone and piano, later for string orchestra, percussion and computer. Her Symphony #1: Ballet for Orchestra, commissioned by the National Orchestra, was written thanks to a Guggenheim Fellowship, which allowed her to take a year off from teaching. This is the work given in depth analysis in this chapter. In 2005, Finish Line was inspired by the Italian Futurist Giacomo Balla. In 2007 Solstice, commissioned by the Houston Symphony, was written for Trombone and Orchestra, and orchestrated for brass, percussion and strings. Bricolage (2008) is for flute and computerized prepared piano. In her interview with Slayton, McTee says that her youthful experience of "nature's perfection, peace and beauty…fed [her] musical soul" (324). Much of her musical thinking was "informed by the writings of Carl G. Jung." In composing she begins with "a breath, a feeling, or a physical gesture," never with a technique, though she has used both chance and serial techniques in her music. She insists that composing is a psychological process, though never taught as such. Susan Botti's early training was in voice, piano, acting and art at the Cleveland Institute of Music, after which she attended Berklee College of Music in Boston, and Manhattan School of Music, where she earned a master's in music composition. Freelance work in New York City as composer, vocalist and actor followed, in theatre, film and television productions. Especially notable was her work with Tan Dun, including Tan Dun's forty minute work for soprano and large orchestra, Red Forecast, in 1996, and the part of Water in his 1995 opera, Marco Polo, produced in Munich, elsewhere in Europe and by the New York City Opera. It was recorded by Sony. She later was soloist in Tan Dun's 2006 film score The Banquet (ye yan). Botti was on the faculty of the University of Michigan from 2000 to 2007, long enough to earn tenure. At Michigan she collaborated with the poet Linda Gregerson. Botti also set to music poetry by Denise Levertov, e.e. cummings, Rabindranath Tagore, Lewis Carroll, and others. During this period she won several major awards, including a Guggenheim and the Goddard Lieberson fellowship from the American Academy of Arts and Letters. She was also a fellow at the Cleveland Orchestra for two years, 2003-2005. Following that she was awarded the Rome Prize from the American Academy in Rome, for residence there in the 2005-2006 season. In 2007 Botti began teaching composition at the Manhattan School of Music. Cooman, himself a prolific composer and fine organist, says that "Botti's style of vocal writing is infused with a sense of drama and stagecraft. If there is a single unifying thread that runs through Botti's output, it is a sense of drama expressed through a colorfully lyrical language," owing to her acting experience. Botti's vocal writing includes improvisational passages, "always in the service of the dramatic impulse" (55). Botti's harmony is multitonal, favoring major or minor seconds and perfect fourths or fifths.. She moves between atonal and modal contexts. Her melody is gestural. Line and shape come first with her. She composes without bar lines, putting them in later. Jabberwocky (1990), a setting of Lewis Carroll's poem, is for soprano and percussion. Botti sang it herself, undoubtedly a good thing as the score is entirely graphical (example shown) and the music is aleatory and improvisational. Lutosławski introduced her to structured aleatory. Cooman credits Lutoslawski's wife Danuta, an architect, with developing the Polish composer's notational style. Botti also credits Gubaidulina and Kurtag for models of freely expressive vocal notation. Cooman warns the performer that Botti's music is full of such notation. Jabberwocky became scene 10 of Botti's chamber opera Wonderglass. Another major theatrical work by Botti is Telaio: Desdemona – Dramatic Soliloquy, based on Shakespeare's Othello. It was premiered in Detroit and staged in New York in 1947 at the Society for Ethical Culture. (Telaio means frame.) The work's duration is forty-five minutes, plus a ten-minute Prelude for 7 Instruments. Two pieces for the Cleveland Orchestra were the energetic Impetuosity and the lyrical Translucence. The latter was based on a song for tenor and harp, "The Exchange," by the poet May Swenson. Cosmosis is "the only known work" for soprano, women' chorus and symphonic wind ensemble. Based on two poems by the same poet, several bands in a consortium were involved. Cooman's extended – and very readable – analysis is of Botti's 2001 Echo Tempo, a double concerto for soprano, percussion and orchestra, commissioned by the New York Philharmonic. It was the first work she wrote for full symphony orchestra and she sang the vocal part at the premiere. The work is a dramatic setting of four translated Native American texts: "Spring is Opening": (Pawnee); "Neither Spirit nor Bird" (Shoshone), a love song; "War God's Horse Song II" (Navaho); "In the Great Night" (Papago) – also known as "Owl Woman's Death Song." The work is a cross-cultural cycle of the seasons. In a "Coda" Cooman says that "Botti consistently imbues her music with a notable and genuine drama. Her theatrical pacing allows her music to unfold its story (whether programmatic or non-programmatic) with gripping intensity, and her compositional training allows her to present these ideas in richly expressive language." Judith Shatin's professional career dates from the late 1970s and in that time she has won numerous awards, including four National Endowment for the Arts fellowships. She has had the privilege of residing at Yaddo and the McDowell Colony, as well as Bellagio and Virginia Center for the Arts. Commissions include those from the National Symphony and the Kronos Quartet. Currently ArkivMusic lists eighteen discs with her music. Her studies were at Douglass College, Juilliard and Princeton. Among her teachers were Gunther Schuller, Milton Babbitt, whose depth of thinking about music impressed her, and Otto Luening, with whom she worked well: she appreciated his ideas and openness. She was also influenced by Cage. Shatin avoided "guru" type teachers. Following college she went to Aspen where she encountered George Crumb, Jacob Druckman, and Iannis Xenakis. Shatin has been on the faculty of the University of Virginia since 1979. She credits serious listening, as to the pitches of bird songs, as a link with her composing. She says "hearing the world leads to music and music leads to the world. They are mutually informative." (407) Judith Lockhead tells us that "in Shatin's music, the pathways into the world are most clearly present in two works: COAL, a folk oratorio, and Singing the Blue Ridge, a piece for mezzo, baritone, orchestra, and electronics" (407). Lockhead offers brief analyses of Piping the Earth, for strings and percussion; Dreamtigers, for flute and guitar, based on a prose poem by Borges; Werther; Time to Burn; Cherry Blossom and a Wrapped Thing; Elijah's Chariot; and View from Mount Nebo. Lochhead's long analysis is of Penelope's Song, concerning the long patient wife of Homer's Odysseus. Lockhead finds Shatin's music to have great beauty and integrity. Shatin says her musical imagination was affected by her study of neo-Gestalt psychology, with reference to the organization of patterns, "especially ambiguous ones." Since becoming a composer she has noticed two major changes affecting her musical imagination: hearing music from diverse parts of the world; and the advent of digital sound. Shatin is interested in the sensuality of sound and the psychological feel of it. She takes a very personal approach to composing. Her interest in electronically generated sound comes from her focus on timbre and sound generally. She likes working with instrumentalists because they know so much about the "timbral worlds" of their instruments (431). This has been an extraordinarily lengthy account of this book, but I believe that to give an adequate sense of nine very different composers, by no means all universally known, lengthy treatment was called for. Of course, if I did not consider this a worthwhile and informative anthology I would not have bothered. Highly recommended.